To prepare cake, coat 6 (8-ounce) ramekins with cooking spray. Sprinkle ramekins evenly with 3 tablespoons sugar, tapping out excess. Combine 1/4 cup plus 1 tablespoon sugar, 1/2 cup water, 2 tablespoons butter, and egg yolks in a large bowl. Stir with a whisk until completely combined. Weigh or lightly spoon 2 ounces flour (1/2 cup) into a dry measuring cup, and level with a knife. Combine 2 ounces flour, 1/3 cup cocoa, and salt in a medium bowl, stirring with a whisk. Add flour mixture to yolk mixture, stirring until well combined (mixture will look a little grainy). Place 3 egg whites in a large bowl; beat with a mixer at medium speed until foamy. Gradually add 1/4 cup sugar, 1 tablespoon at a time, beating mixture at high speed until medium peaks form. Gently stir one-fourth of egg white mixture into batter; gently fold in remaining egg white mixture. Divide batter evenly among prepared ramekins; place on a baking sheet. Bake at 350° for 20 minutes or until a wooden pick inserted in center comes out clean. Cool completely on a wire rack. Run a knife around edge of ramekins; carefully invert cakes onto dessert plates. To prepare sauce, combine 1/4 cup water, 2 tablespoons sugar, 2 tablespoons cocoa, 1 tablespoon butter, and 1/2 teaspoon flour in a small saucepan over medium heat. Cook 2 minutes or until thick and bubbly, stirring constantly with a whisk. Remove from heat; keep sauce warm. To prepare topping, combine 2 egg whites and 2 tablespoons sugar in the top of a double boiler, stirring with a whisk. Cook over simmering water until sugar dissolves (about 2 minutes), stirring constantly with a whisk. Pour mixture into a medium bowl. Beat with a mixer at high speed using clean, dry beaters until stiff peaks form (about 2 minutes). 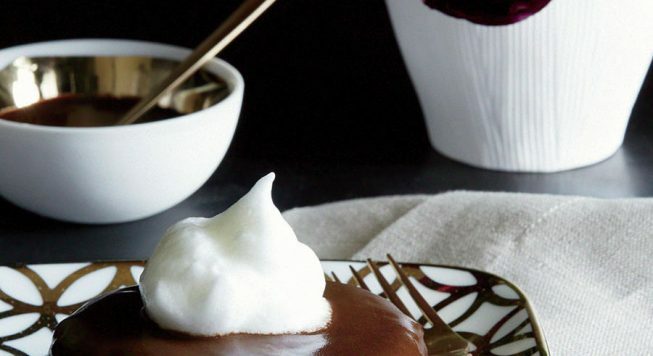 Top each cake with about 1 1/2 tablespoons chocolate sauce and about 1/4 cup meringue topping. Garnish with mint leaves, if desired. Serve immediately.